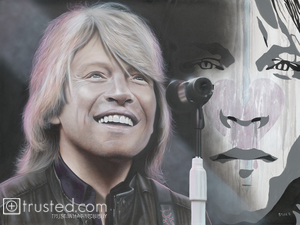 Another highly requested piece throughout the years – Bon Jovi was inevitable. Much like their New Jersey counterpart Bruce Springsteen, Bon Jovi’s blue collared approach to music coupled with their ability to mix musical genres has enabled them to remain relevant through three decades and show no signs of slowing down. At over 130 million albums sold and an induction to the Rock N’ Roll Hall Of Fame in 2006, Bon Jovi has become one of the most successful bands in history. As both a band and a singer/songwriter Jon Bon Jovi has gone through many transformations throughout the years both artistically and visually. 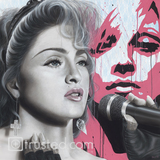 I chose a late 90’s version for this piece because it portrayed an era in which they were able to remove and transform themselves from an eighties “hair band” and grow with their demographic and remain relevant – a feat that has rarely been accomplished.